This is the first of a series of articles comparing and analyzing these systems as a means of discussing the overall concept of social credit and the plans for building China’s social credit system. I am hoping that by looking more carefully at primary sources we can start to tease out what Social Credit is, and isn’t. No Anonymity (from government) – The use of ‘real name systems’ linking all financial and communications accounts to an individual’s national ID card or an organization’s uniform social credit identity number means there is always someone to be held accountable. Broad Understanding of Credit – The social credit system is meant to encompass something beyond one’s ability to pay back loans. It is a judgment of moral character- of the ability to keep promises and fulfill legal commitments. Development through Targeted Application – In addition to provincial regulations, the social credit system has been slowly building through a wide number of regulatory documents in many fields, which often contain industry-specific blacklists, punishments, and rules on information gathering and sharing. Long arm of enforcement – A wide range of consequences, sometimes not directly related to the offending conduct, are available to encourage people to act in a ‘credit worthy’ fashion. Personal Responsibility – While most of the social credit documents available today focus on businesses and organizations, those rules also often hold organizations’ ranking management and directly responsible persons accountable as well- meaning that corporate limited liability isn’t a shield from bad ‘social credit’. Information management and sharing – The heart of the social credit mindset is harnessing digital information to shape conduct, and the rules regularly require the creation of new information platforms, lists of ‘untrustworthy’ people and entities, storage of information, but also rules for the protection of privacy and for credit restoration. Finally, it must be said, that while social credit is one part of China’s broader plan to create a surveillance state, it is only one part. China’s ‘Policing Cloud’ information sharing platform, ubiquitous video cameras, and even DNA collection should be areas of great concern to defenders of privacy and dignity. There is little doubt that China’s police can access a wide range of government and privately held data when they feel justified, with few external checks. This is true irrespective of the social credit system. From the names of the four provincial regulations alone, you can see that their scope is likely somewhat different. Shanghai’s is the broadest considering Social Credit generally, followed by Hebei which limits the topic to ‘social credit information’, then Hubei’s narrower ‘information management’ and Zhejiang’s addressing only Public Credit information, while the others also consider ‘market information’. 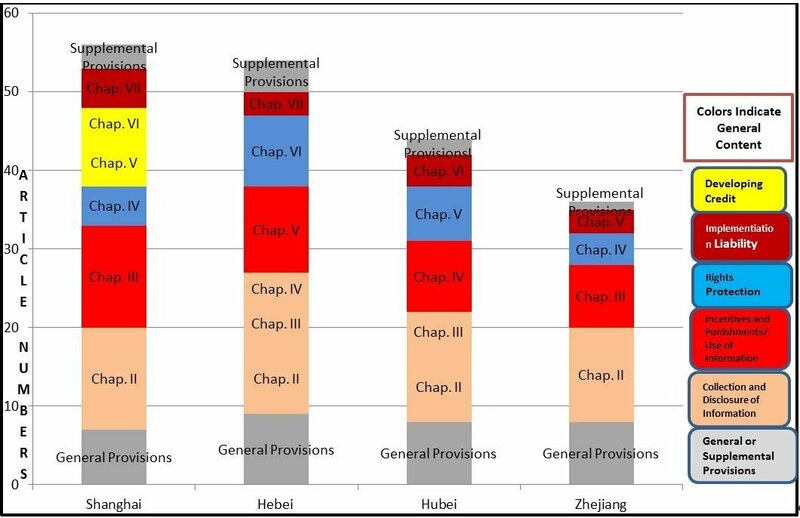 The following chart attempts to more clearly represent what amount of text is spent on several general content areas. This first article will focus on the punishment and incentive systems. 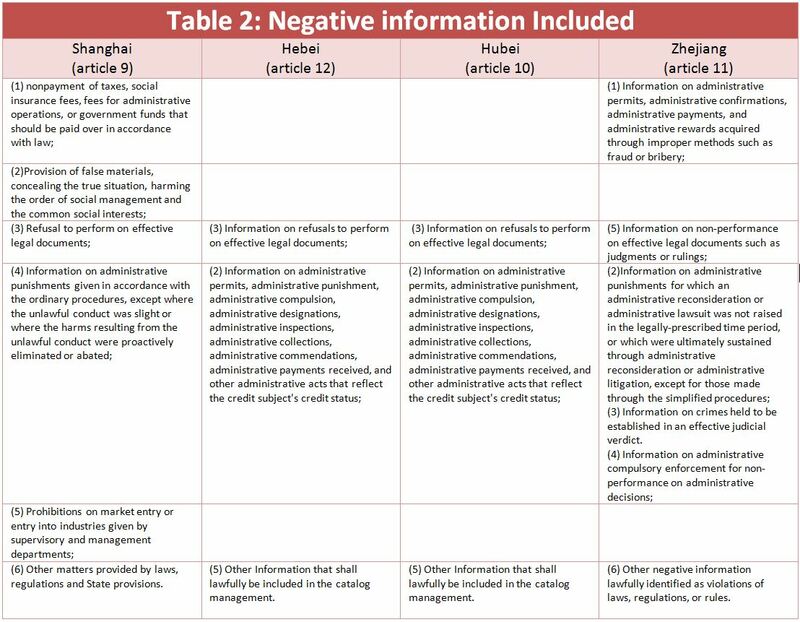 Each of the regional social credit regulations specifically identifies what negative information is to be included as part of a credit archive (see table 2 below). While the specific items included as negative information vary a bit from region to region, they are all heavy on information related to government regulation, including where administrative action is taken against a business for violating industry specific rules such as on excessive polluting, violating health codes, or publishing prohibited material. This fits with the social credit systems’ primary focus on organizations rather than individuals, and its development through blacklists and credit systems targeting specific industries. Unlike the evocative image of people and businesses constantly rating each other (which many delivery and service apps do independently) the ‘social’ component of these social credit schemes is largely about making ‘credit’ information publicly accessible and inescapable. Public shaming and reputation loss as a means of enforcement in China aren’t new, but the internet allows this to be kicked up a notch through public broadcast and data integration. While a few rating systems used in some social credit pilots and commercial products have monopolized foreign media coverage, the heart of the system is less about assigning a ‘score’ than about creating a digital archive of an entity’s performance on obligations. The systems are probably more akin to a criminal record than to a credit score. 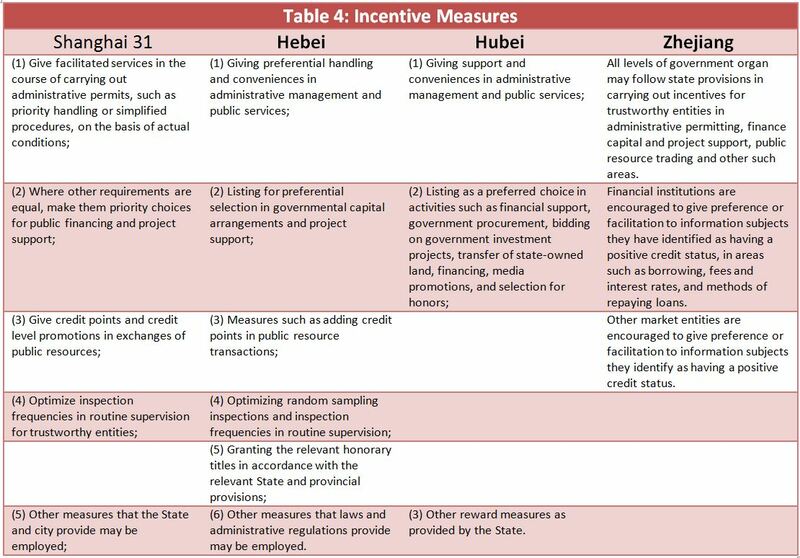 In addition to the consequences of having general negative credit, with the exception of Hebei, the regional regulations also mention possible inclusion on a ‘List of the Seriously Untrustworthy’, which merit heightened punishment. 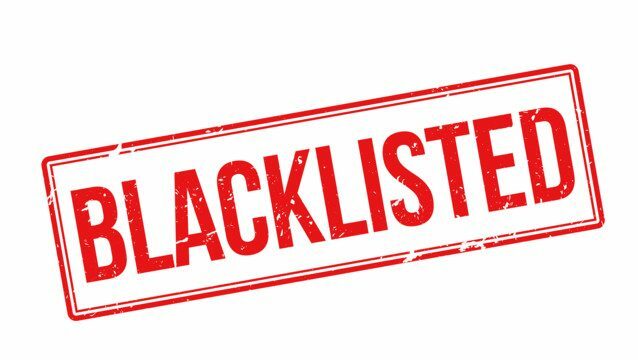 The requirements for inclusion in the lists are generally that one endanger others or national interests through their untrustworthy conduct, but remain unnervingly vague despite definitions in the relevant articles. See table 5. If you find yourself on the list of the seriously untrustworthy, you could face some hefty consequences. You may lose business licenses, be banned from entering certain professions, lose social benefits or worse. ‘Limits on high-spending’ is not just an empty term, but is the centerpiece of another part of the social credit system; the court systems’ judgment defaulter list. The courts have begun publishing the names of people who fail to perform on court judgments, and inclusion on this list results in a cascade of spending restrictions, including on purchasing plane tickets, entertainment, and even private school education for one’s children. It is not yet clear whether the limits on higher spending mentioned in the Provincial regulations intends to copy the court system, but enforcement of the courts’ system required a massive M.O.U. signed by almost 50 government departments, and I have not yet seen an equivalent, even at the provincial level, for the regional regulations. Being a ‘judgment defaulter’ means that a valid judgment exists against a person or organization, that they fail to perform on that judgment, and that court finds that they could perform but are refusing or somehow obstructing performance. China’s courts are not independent, but having gone through the court does ensure that there was some opportunity for presenting evidence and appeals before penalties were imposed. Most court judgments are for monetary payments, so restricting luxury expenses at least seems somewhat fair (if you have money for fun, it should be going towards the judgment). Some court judgments, however, are not- such as rulings for official apologies, family visitation, etc. ; and there are already cases of people entered into the list in such situations. In these cases, prohibitions on high-spending seem like a bad fit. Lack of notice: a number of incidents have occurred where people only learn they are included on the list when they are denied services, such as purchasing airplane tickets. If the goal is to encourage performance, they should be told as soon as possible. Part of the problem may come from the extended individual liability when corporations are included. The corporation may have been given notice, but not someone liable due to a controlling interest in the company. Difficulty in removal: Those not aware they are on the defaulters list can’t work to get off it, but even those who are aware seem to have trouble being removed. This may be inevitable in any bureaucracy but must be improved if the system is to be perceived as just. The social credit system’s digital archives are ultimately extended enforcement mechanisms for existing rules. As mentioned above, most of what is considered negative credit information is information on administrative regulatory measures taken against you. Private businesses are also encouraged to consult social credit system blacklists and other information in making decisions on purchasing, hiring, and so forth. China has always punished conduct that most believe should be legal, like speech. So, in considering potential issues in the emerging social credit system, I suggest looking at social credit in those areas where there is disagreement with China’s regulation more generally. It’s no surprise that to find that social credit doubles down in problematic areas. Consider the Internet Group Information Service Management Provisions, as an example. It is a regulation on speech in internet forums and chat groups. The rules broadly hold service providers and the creators and managers of online groups responsible for speech by others in the group. In China, harsh punishments for speech in private chat groups are not hypothetical, and the rules encourage companies and users to report each other. Article 7 requires that “Internet group information service providers shall establish a user credit level management system, providing services corresponding to credit levels. “ (emphasis added). Article 11 requires in part that “Internet group information service providers shall establish a black list management system, entering groups, group founders, group managers, and group members to the black list for violations of law and agreements where the circumstances are serious, limiting group service functions, storing relevant records, and reporting to the relevant competent departments.” (emphasis added). Decreasing the level of access to internet services, not as the result of a criminal or administrative ruling, but as the result of an undefined credit variable, seems to be very new and very dangerous. The credit in these rules likely doesn’t even reflect a nationally standardized system, but one created by the service provider who is trying to satisfy their own obligations under the rules. This is where the social credit system gets closest to the everybody-rating-everybody nightmare that depicted by so much media coverage of China’s Social Credit. To protect themselves from liability, everybody needs to keep others in check. There is little to lose by overzealously limiting services, but real consequences for failing to stop others who are breaking the rules. In discussing the fight against corruption, Chinese experts often talk about first making a system where officials dare not be corrupt, then one where they cannot be corrupt, and finally one where they don’t even want to be corrupt. And finally ‘want not’ means everyone having internalized good ethics and ideology, so that they no longer desire to break rules. The estimated value for a full translation of this post is $694.02 USD at the below-market rate of $.06 per character, with 10,917 characters.